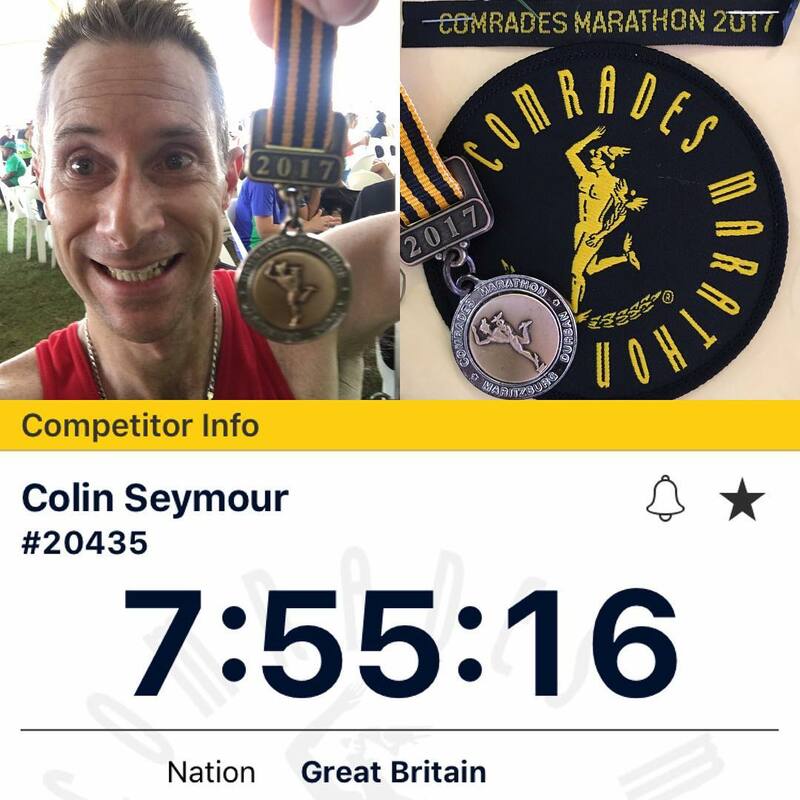 With just short of 2600km of dedicated training and racing over six months in my legs, I embarked upon the final test of all my training, and the ultimate purpose of it all: the Comrades Marathon, and what a fantastic race and event it was. I started the day bright-eyed and bushy tailed at 3am for my usual pre-race bulletproof coffee and catching up on the world's news whilst the coffee worked its way through my system. At about 4am, I leapt out of bed, abluted, smothered myself in suncream (I swear by UltraSun 20), lubed up (I don't normally, but you can never be too careful on such a long race), dressed, shovelled down a plain omelette and we headed out the door and made our way from my uncle's house in Umhlanga to the race start in Durban. As Umhlanga isn't that far from the city, and very little in the way of traffic, it didn't take long to reach the city where we double-parked outside the expo centre to boot me out and for my wife to take over driving in no time. I then walked round to the start, and that's where all the excitement begins. The start was positively buzzing with loads of people milling about handing their bags into the bag vans, squeezing out that last tinkle and then trying to find the entrance to their respective starting pens. Thanks to a fast qualifying marathon time, I was ceded in start zone A right at the front (just behind the elites) and made my way there. Getting into this area was painless and took way waaay less time than I was expecting. I was expecting to have to queue and jostle to get in but I didn't. I just walked straight in. There were also less people in this pen than I was expecting too. Once in the pen I really started to feel the excitement around the race. Loads of people chatting and eager to get running. It was at this point that I discovered the battery in my HR strap had died. I didn't know it for sure are the time as the only thing I could tell was a problem as my watch couldn't find the strap. At first I put this down to the sheer number of other people around but then realised I've not had this problem in other races so concluded the strap battery was dead which was a bit of a bummer as I'd planned on using my HR to restrict my pace for the first 37km. I didn't let this affect me too much as I knew the watch itself can measure HR, though not as accurately as I'm used to with the strap, but more importantly I knew that nose breathing was all I really needed to do to keep within the cardio zone I'd planned to run the first 37km in. With less than ten minutes to go the commentator started the traditional Comrades start "procedure": the dropping of the tape separating the ceding pens, the shuffle-forward-and-squeeze, the singing of the South African national anthem, singing Shoshaloza, listening to Chariots of fire and the recording of Max Trimborn’s three cockerel crows followed by the ten second countdown and the firing of the cannon to send us off on our way. It took me eighteen seconds to cross the start line 😁. There's something about this clip that really strike a chord with me. When I first heard it one crisp Sunday morning, it sent shivers through me; when it started, when Shoshaloza was sung, when the traditional cockrel crowed, when Chariots of Fire played and then when the gun went off and the announced announced the start of the race. By the end of the little segment I was on the verge of tears with a great big lump in my throat and I was almost walking. For some reason this little clip has had a profound impact on me. Being there in person was even better than listening to a recording, and I was a big baby and let those tears stream down my cheeks. It was absolutely fantastic. Anyway, back to the race. As is common with every race, many people raced ahead like their lives depend on it, however many more held back and ran at a very sedate pace as we made our way through the city and onto the N3 highway and the start of the climbing - yes, things start climbing as soon as you join the N3 at about 2km. It was quite refreshing to see so many people holding back this early in a race, which isn't surprising given the distance we still had to cover. I certainly held back and diligently kept things nice and easy by exclusively using nose-breathing. Along with keeping things very easy for the first 37km - the hardest kilometres of the up run - I also planned to use a run-walk strategy for the big hills. The strategy was to run about 200 paces and then walk 100 and repeat until I reached the top of the hill and then free-wheel down the other side. Well, that was the intention and it wasn't until I was most of the way up Field's Hill that I realised that I really should have used the strategy up Cowie's Hill and then Fields Hill - I was feeling so fresh that Cowie's didn't really feel that steep 😄. 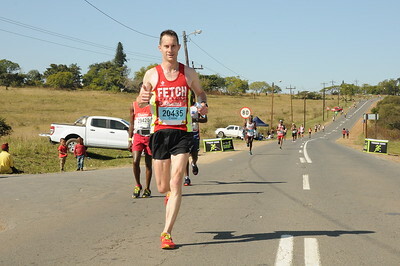 I certainly stuck to it up Botha's Hill and up to Inchanga and then it became a case of "if I've got the energy to pick up the pace uphill, I will" which turned out to be mostly walking, but more on that later. For the most part my restrained start worked a treat and I found myself ticking along nicely and making good progress. I eased over the first two big hills, looked out for my wife on Kloof Main road but didn't see her as she didn't get there because Google Maps didn't know the motorway was closed and Kloof is a bit of a pig to get to when the motorway and old Main Road are closed, ticked over Botha's hill, waved to my wife on the other side, admired the wall of honour, doffed the cap I wasn't wearing to Arthur at Arthur's seat and took in the spectacular views of the Valley of a 1000 Hills, all whilst taking in the crowds and feeling nice and relaxed. Things were going great… until Drummond. They say, assuming you've put in the training, Comrades is 90% from the neck up. I can confirm this is is indeed the case. It was around about Drummond that things started taking a turn for the worse; I started showing signs of cramping. I was a little concerned about this, but not too much as I'd come prepared for this situation; I packed six electrolyte tablets so swallowed two of them whole, took it easy through halfway and continued up Inchanga, glided down the other side and received a little boost when I saw my wife on the waving and cheering for me. It was just after Inchanga that all hell broke loose in my mind. The signs of cramping weren't subsiding and were spontaneously turning into "verge of a cramp" twingy moments and I started to doubt myself. I had visions of hobbling the remaining 43+ km on the verge of tears in much the same state I was at the Berlin marathon last year and was contemplating throwing in the towel but then the bloody-minded and stubborn part of me stood up to the plate and I rationalised that I'd still be well under the 12 hour cut-off even if I walked to the end; after all my only real goal was to finish the race and enjoy the whole experience. 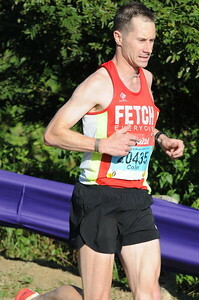 It was also around this point that I confirmed that, whilst certainly within my capabilities, and confident I'd found a way to control my cramping, a sub-7:30 and a silver medal were not on the cards this year so I just "sat back", relaxed, took in the crowds of spectators and company of other runners and enjoyed the rest of the race. I kept the possibility of a sub-8 in the back of my mind though. Oh yes, and I put on a brave face as I ran through the very well spectated Camperdown and waved at my wife again. By the time I got to the Umlass Road, the highest point in the race, I was starting to feel much better but now fatigue from all that running was starting to take effect. Thankfully it's a big long downhill from Umlass Road to the bottom of Little Polly Shortts so I free wheeled all the way down without my legs showing many signs of cramping. This free-wheeling was just what I needed. I was ticking over the kilometres at well below 5:00/km and felt like a runner again. I whipped out the run-walk strategy for Little Polly Shortts, though only running for a 100 paces this time, cruised down the other side, whipped it out again at the bottom of Polly Shortts and then discovered I just couldn't do it. My legs were knackered and there was no way I was going to run-walk all the way up Pollys - I didn't have the energy or the inclination - so I did what everyone else was doing: I walked all the way to the top. At the top of Pollys I knew that with a little effort and minimal walking, a sub-8 was definitely on the cards. I also knew I'd have my number one supporter, my wife, just the other side for another little boost of energy and motivation for the final kilometres to the finish. Everyone will tell you that the nicest thing about Polly Shortts is "it's all downhill to the finish once you've reach the top"… except for the bit that everyone forgets: there's a little sting in the tail as you enter Pietermaritzberg and cross under the motorway. I didn't and even managed to run it all - it's not that big a hill but you definitely notice it. Then it was all downhill to the finish, except for the little hill you have to climb coming out of the tunnel which goes under the track as you enter the Scottsville racecourse. Very cruel but so worth it as once on the grass you know the finish is within crawling distance. I didn't feel the need to crawl though I did have to concentrate hard and hope my legs didn't cramp. They were showing signs of cramping again and I didn't want this to happen on the finish straight. I wound my way along the grass, waved at my wife again in the international athletes area, and finally saw the finish gantry and knew I'd done it. 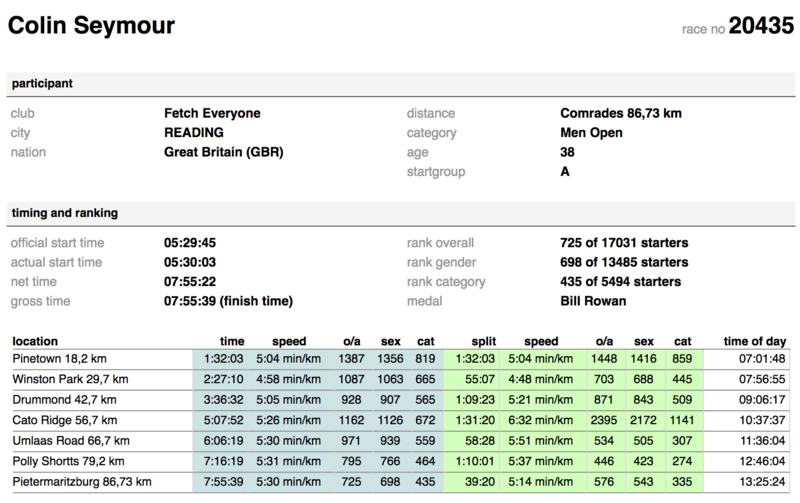 I'd started off well, worked my way through a particularly dark spot, confirmed that Comrades is indeed a very mental race, and come out the other side to finish in a gun time of 7:55:39. I was chuffed to bits and hooked. I hobbled over to the international athletes area to meet my wife, tuck into some grub and have an ice cold beer… oh I was soooo looking forward to that beer. Sadly I had to endure the hour drive back to Umhlanga to get a good beer (I had two) as the only beers offered in the international tent were Becks Blue alcohol free (WTF!?) or Castle Lite lime. I tried the Castle but didn't finish it - lager + fairy liquid == 🤢. 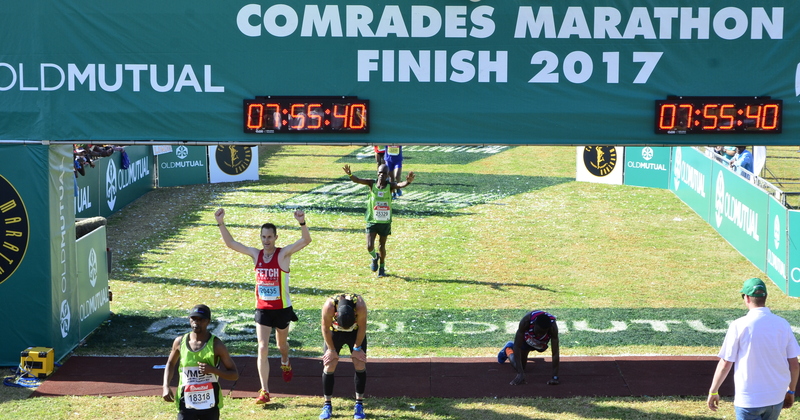 The Comrades marathon is singularly the best race I have ever run. It's an incredibly tough and challenging race that really challenges you both physically and mentally made all the better by the incredible support, crowds and atmosphere of the whole event. The London marathon is a big event with great crowds but it pales in comparison to Comrades in my opinion. I can definitely see how people get hooked on this race and run it year after year after year. If I still lived in South Africa, I'm almost certain I'd become one of those people. So will I be back? Most definitely!!! And next year too to run the down run, pick up a silver 😉 and my back-to-back medals. I might call it a day for a few years after that, but we'll see. Never say never.